John Legend on why the NFL protests are patriotic. The kneeling players are asking America to do better on criminal justice. 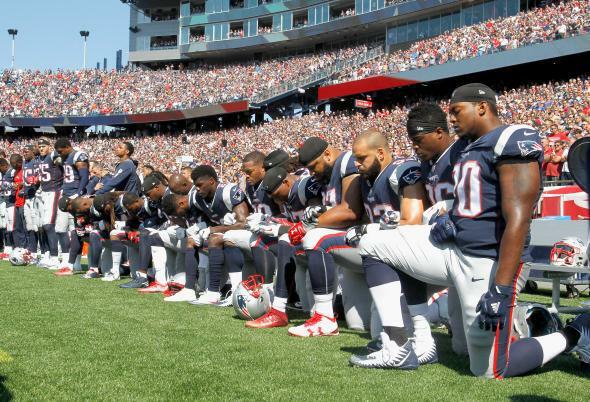 If I could, I’d take a knee and join them. This is an act of patriotism. The president of the United States loves to drape himself in the symbols of patriotism, but fails to respect the ideals at the core of our Constitution and national identity. Trump may love the flag, but he doesn’t love anything it’s supposed to stand for. He actively encouraged a hostile foreign power to infiltrate our electoral process. He wants to suppress millions of Americans’ right to vote because they didn’t vote for him. He routinely undermines freedom of religion with his rabid Islamophobia, attacks the free press with disturbing regularity, and is now attacking the rights of the people to peacefully protest. These protests woke Americans up from complacency. And combined with other forms of social activism, they helped to show citizens, policymakers, and anyone listening that there could be a better way. That hope was not just an idea—a better future was both necessary and possible. But even without this activism, the players’ protests are important. Because of them, almost every day of the week, we talk about racial disparities. People across this country are suddenly thinking about what it must feel like to be a person of color, watch an officer shoot an unarmed man, and walk away with a pension. And every time someone takes a knee or raises a fist, viewers must grapple with the why—with the uncomfortable reality that our country daily marginalizes thousands of people in impoverished communities. I sing for a living—no one would want me on their NFL team. But if I could, I’d take a knee on Sundays. Because these conversations are necessary for progress. Because these protests are their own form of a pledge-of-allegiance—allegiance to the ideals that are our nation’s founding principles, which many heroes have given their lives to defend. They are the definition of patriotism.